UrBanPerspectiV BLOG: Red Hot ..and Steamy!!! 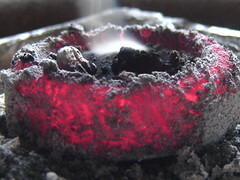 This is a piece of red hot charcoal brickett, with frankincense burning on it. You can find these sorts of things if you know where to look in Philly. The charcoal is about 2 inches in diameter, and they come in stacks of about 6 or seven, usually wrapped up in aluminum foil. If "who ever" is selling these charcoal bricketts, there's usually rock incense around. Trust me if you have a choice, go with the Frankincense stones. More pleasant fragrance than Myrhh stones. Anyways, you just light one brickett, and then put on ONE stone only at a time, They tend to produce alot of smoke, so one stone is suffiicient . Make sure your red hot charcoal is on or in a heat resistant surface or container. So just in case you ever wandered into one of these little shops, and see the charcoal all wrapped up in aluminum, or the small plastic baggies of stones,pebbles labeled with some flavor, (and it's usually only going to be Frankincense or Myrhh, ) ...you won't have to ask yourself ... I wander what that's for? This Shot is Off the Roof ! !